It's A Dan's World: BLOGGING? COMICS? IADW? Got A Pop Question You Don't Know What To Do With? BLOGGING? COMICS? IADW? Got A Pop Question You Don't Know What To Do With? Comics? It's A Dan's World? New Zealand? Blogging? Australia? Have you got a question you would like to chuck my way? This month I'll be creating a Secret Origins post, explaining the birth of this here bubbly blog and the madness as to how it all came about. If you've wanted to find out anything in particular about how it all comes together, life down under or just comics in general, here's a fun way to do just that. 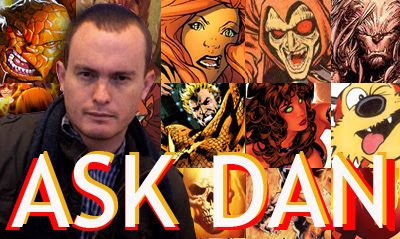 Send your queries or conundrums to iadwmailbag@gmail.com and I'll to add your answers to my Secret Origins post! See, easy as pie (mmm pie)! Dan, or is that NAD now? then there's the obvious joke name i could make from that but i won't go there mate. any body tell ya you kinda look like Sam Worthington in that posting photo? it's still New Years Eve here but something really cool just came my way that you actually had something to do with. but it's really all i needed to make for a good year's end for me that will otherwise be quiet for me. any chance we might be able to substitute one of your mast head squares some day with Bronze Tiger? the color scheme would still be consistent. You know what Dave, it took me that long trying to figure out who of my top characters would work in the whole orange theme I completely forgot about ol' Bronze Tiger. Will have him up there soon. and then there's the women Dan. i'm sure he's been with far more then you and i combined. hey mate your boy Eddie Nunez who's a great artist is getting kinda dissed on the SS blog today. he's a great artist and i still remember your making the mark feature with him a while back.